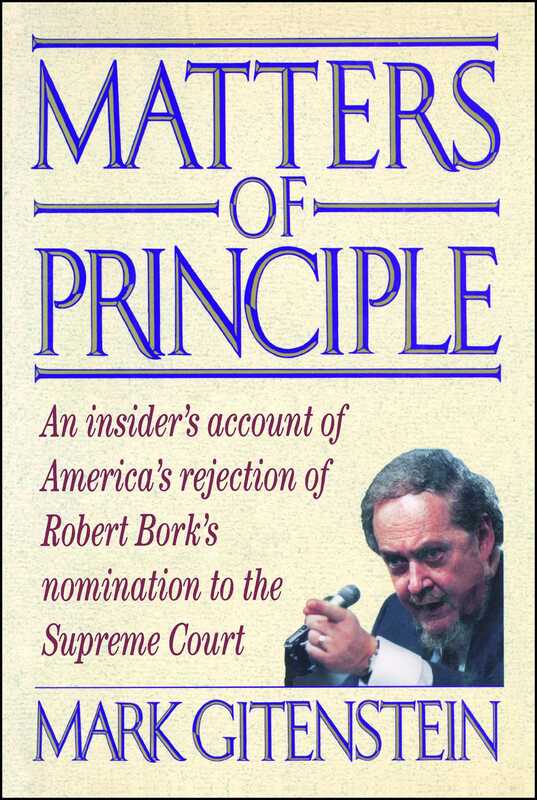 In his bestseller The Tempting of America, Robert Bork portrayed himself as someone whose views are in the American mainstream, and has said that the failure of the Senate to approve him was an aberration. On the contrary, Matters of Principle shows that with the rejection of Bork, Americans emphatically reaffirmed one of the enduring virtues of our national character—a fervent belief in individual rights. In the end, Americans rejected the cramped vision of Robert Bork and the Right. Matters of Principle is a lively, provocative, and thoughtful first-hand account of this tumultuous battle for control of the Supreme Court, a battle that continues to make news but whose strategy was shaped largely behind closed doors. For Joseph Biden, Chairman of the Senate Judiciary Committee, it would prove to be a watershed moment. Biden wanted to be President and was in the middle of a campaign for the Democratic nomination when the process began. Robert Bork’s ambition was to serve on the Supreme Court. Both saw their dreams die amid constant pressures from political action groups, other senators, editorial boards, and the President. The goal for Biden was to make the American public interested in a battle over judicial philosophy without being perceived as a political opportunist. Bork’s aim was to become the standard-bearer of the Reagan Revolution, to project himself as a moderate, while his judicial decisions and his writings showed otherwise. The inner proceedings provide a fascinating look at the players in this event, from the editorial boards of The New York Times and The Washington Post to the Senate chambers of Biden, Thurmond, Kennedy, et al., to the White House, where President Reagan erred enormously, first by choosing Bork, then by adopting faulty strategy to help him, and finally by apparently abandoning Bork and leaving him without strong support. Perhaps most important, Matters of Principle is a story about the clash of judicial ideas and ideals. Mark Gitenstein traces the evolution of Bork’s legal philosophy from his days at Yale through his time in the Nixon Administration, finally offering a portrait of a man far from the mainstream of American beliefs.